Hi I have 4 platys and 4 mollies 1 male of the platys and 1 male of the mollies. My high fin platy (male) is chasing the female around who is a low fin and keeps rubbing on her so I'm presuming that he is mating but she isn't retaliating or she just swims of can she still get pregnant even though she isn't retaliating thanks. A few weeks ago I bought a female sword tail and a male Redwag platy. Both were doing well until I bought 3 guppies and 3 more platies. One platy is green (female), one is spotted (male) and the other is a yellow female. Ever since, for the last few days or so, the Redwag has been going after the yellow female platy in an aggressive way. He will chase her away and nip her hind fun any chance he gets. So she hides in an ornament I have inside the aquarium. 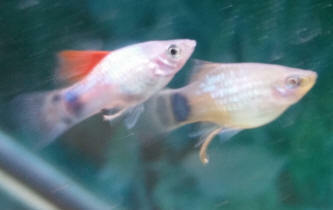 <Male Swordtails and to a lesser degree male Platies are aggressive, towards each other AND towards the females. They're aggressive suitors, if you will, that will try to mate with any female in the tank. That's why you need to either keep just females (easiest approach) or else keep many more females than males (so the males can't pester one female all the time). I don't think she is sick. The Redwag doesn't go after any other fish -until today. I thought maybe he was being aggressive because there were only two females, so I bought 2 more. One is spotted, and one is yellow like the poor female he's been bullying. Well, now he's going after my new yellow female and I can't figure him out. I have a 20 gal tank. I am hoping you can provide some guidance on what would be considered a healthy and reasonable stock of female platies in a 15-gallon aquarium. would really like to make sure they have the space and conditions that will best suit their natural behaviors. Can you help? Thank you so much for your incredibly fast response! I am very grateful. I started with two blue platies and latter learned they were both males. One is mean to the other and relentlessly chases him around even though there are other variety platies that are female in the tank. I latter bought three female blue platies thinking that may help but no such luck. There are a total of 16 fish in a 56 gallon aquarium plus three babies. When I try to net it to put it into isolation it sees the net before it's in the water and hides in the decorations and fake coral. The other fish seem to ignore the net. Makes me laugh as they act like they all know I am after the bully for being mean. This repeats every time I try to capture the bully. He will hide till I move away from the tank. Any suggestions? I thought platies were friendly fish. All the other platies are but this one. <Females are more sociable but you do find the odd grumpy female too. and one of the 20 litres. I have only had my aquariums about 3 months. I went away on holiday and used the 5 day feeder gel formula food and came back and all fish were well. After being home a couple if days I did a 30-50% water change and then next day I saw a baby fish and realised ketchup my red platy was a lot thinner. I also have a fat pregnant swordtail female in the same tank(Tiger). Over the next week I collected 6 more babies from the stones and plants. The first fish is slightly larger and plain and the others are all striped like the swordtail mother. Do you think the plain one that is much bigger could be the lone survivor from the platys litter (or what ever you call a brood in fish) and the striped ones are swordtails like their striped mother? <Possibly, but hard to say. Livebearers of all kinds can delay the development of fertilised eggs, which means that a female can produce fry anything up to 6 months after mating with a particular male. That means the father of your baby fish could have been one of the fish in the pet store. I also wonder if my swordtail is still pregnant as I haven't found any more fry for a few days but she still looks pregnant. I also just want to mention tiger the swordtail female started off being really bossy and aggressive with everything else in the tank and my first swordtail male hid from her and eventually died. I since replaced with a new one who can just barely cope with her. I know this ratio of 1 male to 1 female is not normal but it seems right for her. <See above; Swordtails are aggressive and chase each other a lot. Keep two females per male, in a suitably sized tank, and either one male or three, never two because that number seems to end up with one bullying the other. I got a lyre tail molly female to be boss and she started off hiding from tiger. <Mollies definitely do not belong here! I had to replant and move everything around to give all new territories play and this helped them to fit in better and now the 2 play and thankfully mainly leave the smaller fish alone. I must say I don't like the idea of having just one lyre tail molly but think this is working for the individual fish involved. I think I might sell 6-7guppies and just keep the named male (Albie). He doesn't seem to Fin nip like the others do but would I have an issue with having 1 male guppy without a female or 2 to hassle in with the other fish? The guppies are brothers and sisters so I don't want these particular girls as I don't want to inbreed them any more as I got them from someone who has inbred them heaps. I would want a new gene pool even though they are very pretty. Thank you for your advice. The only thing that I can't really understand is whether one guppy is okay in the communal tank rather than the current 6-8 or whether I need to keep a female to keep him happy? The 20 litre tanks are 1. for raising babies and 2. for breeding food for my tank i.e. brine shrimp or Daphne. What is Dropsy? Is there a link about it? <It's a symptom rather than a disease. Fluid retention inside the body. I was wondering if I have a 46 gallon with two male swordtails and one male platy if I could put four female Platies in there?? Would the male swordtails make the female Platies lives miserable?? I have the four females in a 20 gallon tank on the kitchen counter and I was thinking of taking it down due to space. Thank you!! I recently discovered the Blue Wag Platy. It is a beautiful fish, but it seems that it is really hard to find. Many people on fish discussion boards are asking others about it and no one knows where to get them, unless you live in a place that has a LFS that happens to sell them. I was wondering why they are so hard to find. My spouse says it is because blue must be a recessive gene. I was wondering why there isn't more blue freshwater fish??? I guess the other colors make them easier for a mate to find them. Thank You!!!! anything that would help explain this so here it goes. I have a 15 gal freshwater aquarium (landlord won't let me keep anything larger) with an Aquaclear 30 power filter with sponge, carbon, and ceramic ring inserts. This tank has been set up for about 6 weeks and has had fish in it for 4 weeks. <Borderline for a tank this size; watch the aggression of the males. 1 Black Mystery Snail 0.75"
it seems to have coincided with the addition of the snail which I added about a week ago. Now I've read dozens of times that dead snails pollute the water to horrendous levels very quickly, but what about live ones? Does adding live snails spur a bacterial bloom? When I look at the water it just looks cloudy from a distance (sitting on the couch). But looking at it really closely I can see literally millions of microscopic specks floating around, and if not for these particles, presumably bacteria, my water would be crystal clear. Am I even right here? Is this a bacterial bloom? Or is there a possibility of something else... parasite perhaps? All the fish are happy and healthy, eating, swimming and being themselves. I just hate cloudy water and would like to know if there's a chance this could be something that needs to be dealt with (parasite). Just wanted to say thank you for such a quick reply, its much appreciated. and just went out and bought some filter wool to replace the carbon in my filter, since I don't have any driftwood in the tank (just plastic plants and a few caves) the carbon's pretty pointless. As far as the Platies, I sexed them all when I got them, they are all male. With the exception of establishing a pecking order over the first week, I haven't noticed any aggression between them, in fact they have become quite buddy-buddy at this point. Do you think this will last? Or would you suggest getting females anyway? One last question, as far as the Corydoras go. I was planning on getting a couple more. Should I wait till the tank rights itself or just get them now? I know if I wait, then the addition thereafter could potentially cause another bloom. Just wondering what the best route would be at this point. In a previous email, I mentioned how I had a platy mysteriously disappear from my tank. The female blue Mickey mouse platy is now showing outward signs of pregnancy (typical). The male blue platy constantly follows her around the tank, and takes no interest in the other 2 female platys. He will also chase the other 2 platys away from her, especially during feeding time. Will this cause undue stress on her/ the other platys? Should I attempt to exchange the two wagtail platys for more female blue platys? Hi, my family recently decided to try to become fish owners after we won 2 goldfish at a fair. They both died about a month later. We think they had contracted a disease from the fair tank. Our second attempt at a fish tank is going fairly well. males messing with her. She didn't seem to have any other medical problems. Now we have the two males. (none of the fry lived) Now for the question. We are wondering whether we could keep an all male tank? We are even interested in upgrading to a 20 gal. tank.